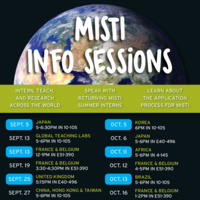 Explore 26 upcoming information sessions for various MISTI programs. Speak with program managers and returning MISTI students. Learn about the application process to intern, teach and research across the world!